All lost and found items will be on display on several tables outside the Multi-Purpose Room for the entire week of Monday, April 8th through Friday, April 12th 2019. Please check out the Merriam Facebook Page for photos of the items. Please pick-up your items by the end of the day on Friday, April 12th – after that items will be donated. 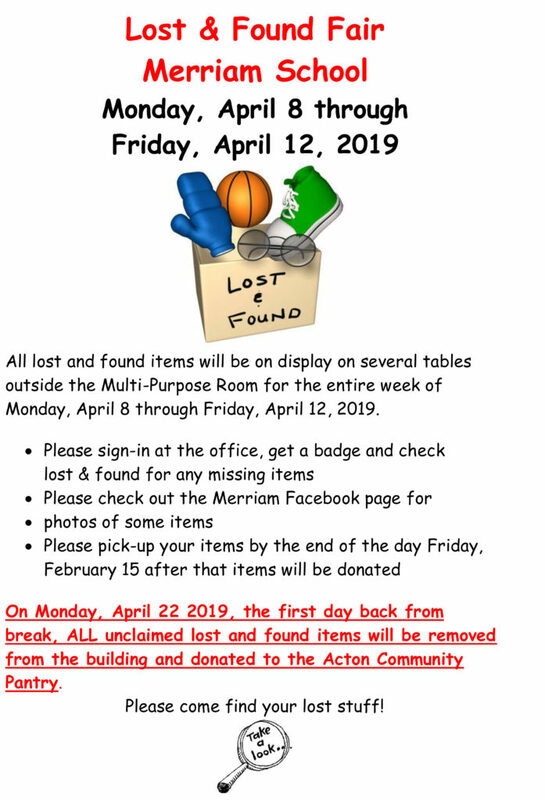 On Monday April 22nd 2019, the first day back from break, ALL unclaimed lost and found items will be removed from the building and donated to the Acton Community Pantry. Please come find your lost stuff! !